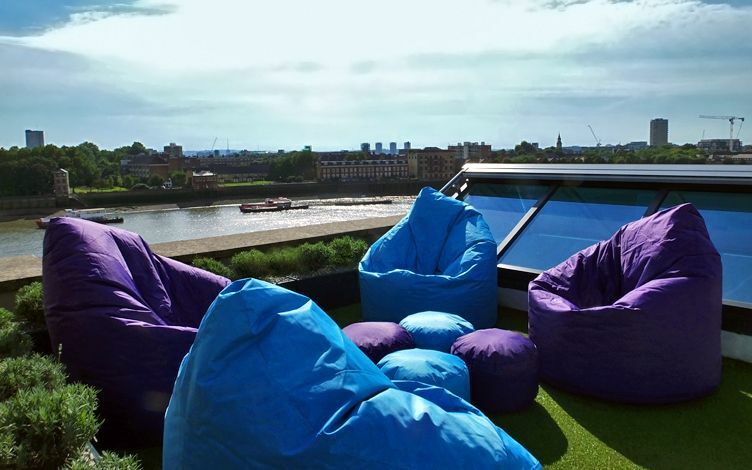 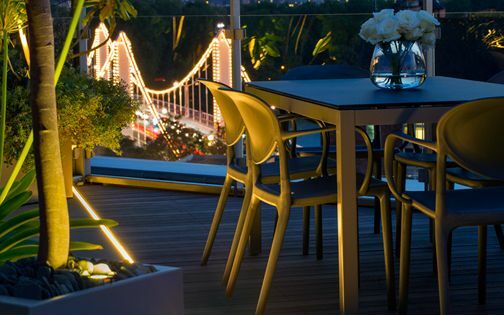 This roof terrace garden design enhances a contemporary riverside wharf ambience, where abundant outdoor lighting, seating zones and urban sculpture form a cosy social hub outside a dynamic penthouse apartment. 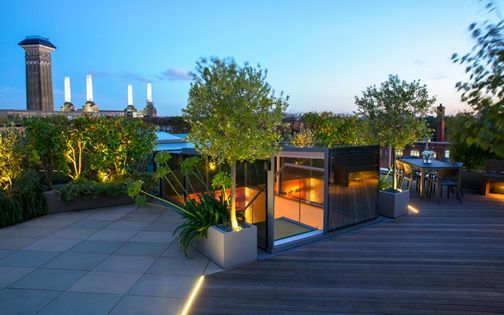 The rooftop's wrap-around outline, together with an upper intimate perching spot, features expansive city views – defining an architectural roof terrace design, galvanised by diverse lush foliage. 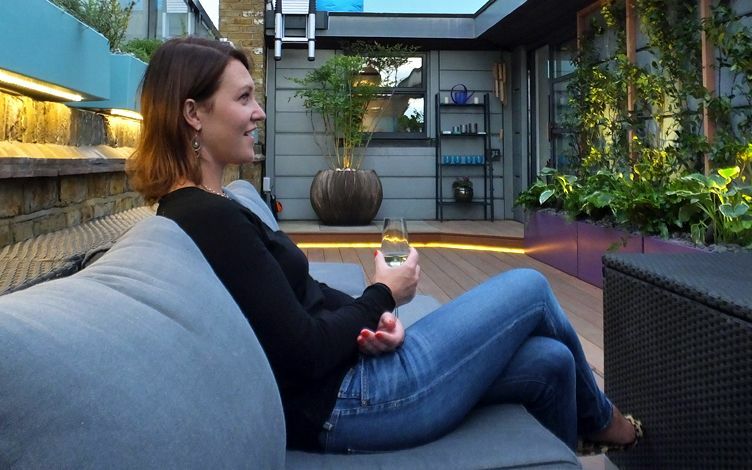 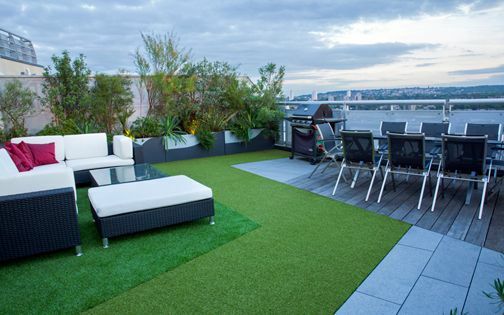 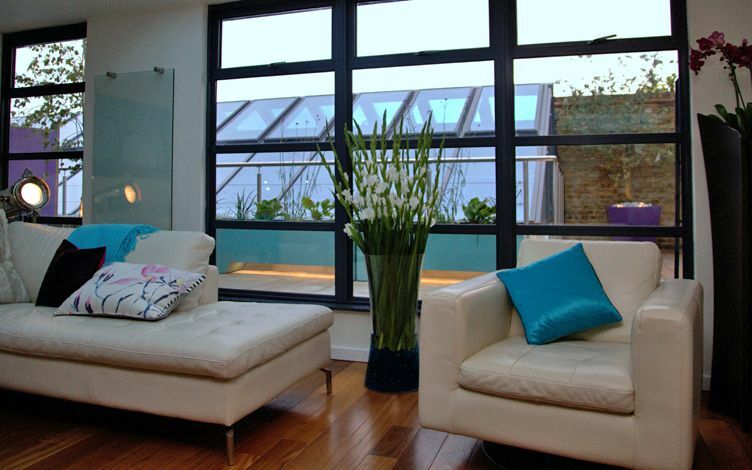 Sited atop a picturesque Wapping wharf, the roof terrace required a detailed overhaul to modernise an underused, sizeable rooftop into an intimate, thriving and functional city garden. 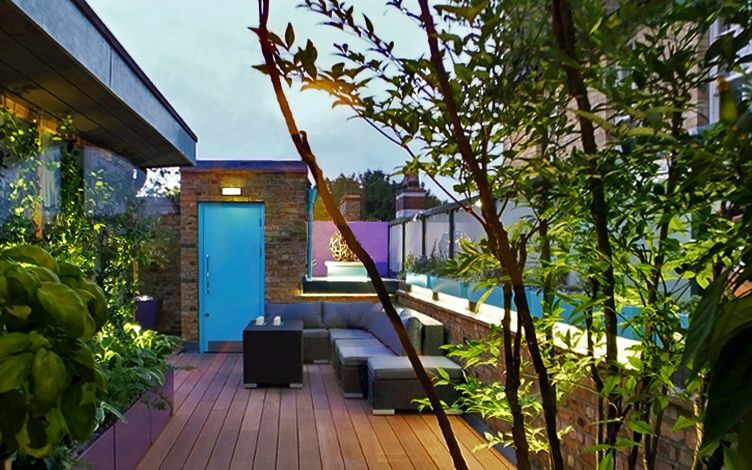 Our client's cheerful colour palette and travel artefacts inspired a personal terrace design narrative, where vibrant tones invigorate a contemporary layout. 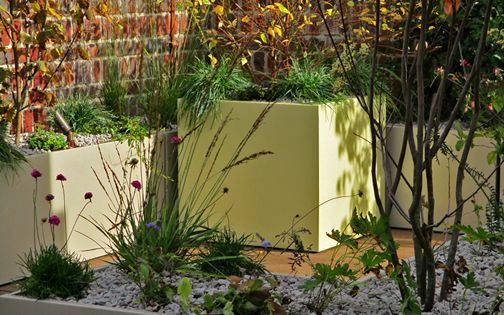 We utilised warm hardwood and buff sandstone alongside powder-coated bespoke planter troughs to feature culinary herbs, architectural trees and scented Jasmine climbers. 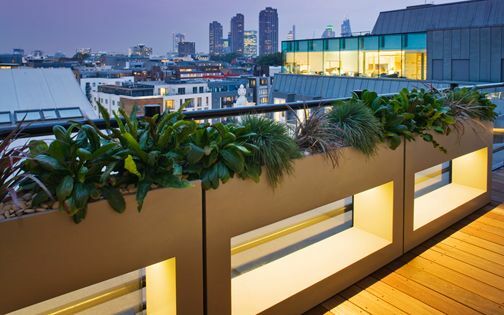 The L-shape terrace outline, abundant in integral niches and alcoves, enabled forming six distinct elevations encompassing contrasting aspects, while a secret upper spot provides an aerial vantage point within a tiered roof terrace garden design. 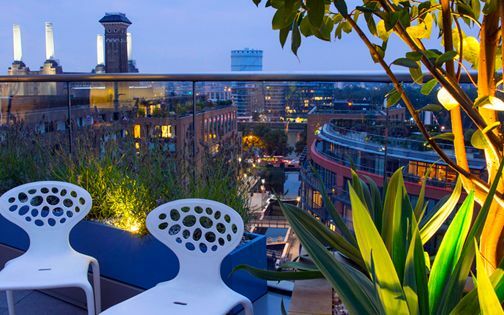 We invited the contemporary sculptor Julian Wild to design and fabricate a spherical artwork to display above the terrace's seating hub, where his recycled copper tubing echoes industrial tones which sympathetically key into Wapping's urban ambience. 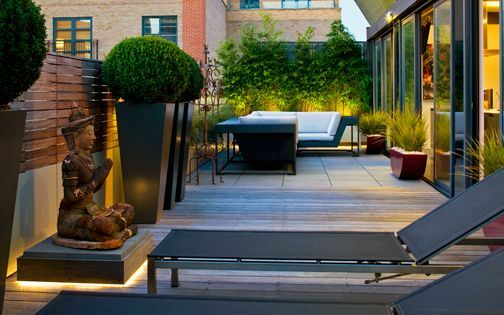 The distinctive modern sculpture, exhibited among a terrace design composition of steel, wood and glass, forms contemporary outdoor equilibrium, while enveloped by London yellow stock brick walls. 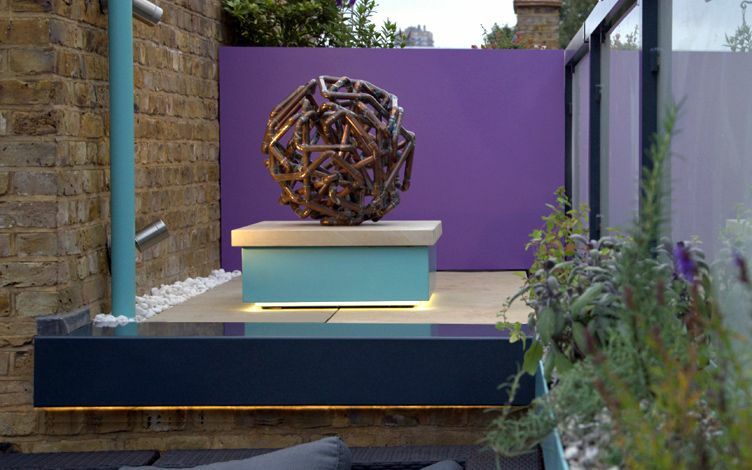 Positioned in a south-facing aspect, this see-through globular artwork generates captivating daylight silhouettes within its surrounding backdrop, heightened by a warm lighting scheme across a connected roof terrace garden design. 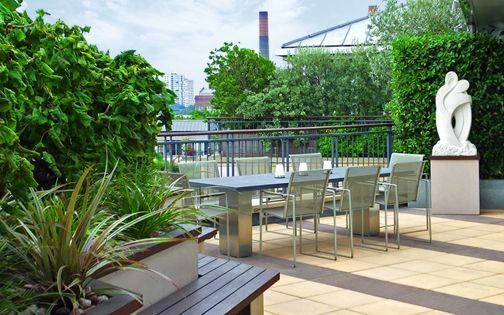 Our extensive renovation included detailing each architectural nuance throughout the roof terrace garden to rejuvenate valuable space into a private, and highly refined, outdoor city sanctuary. 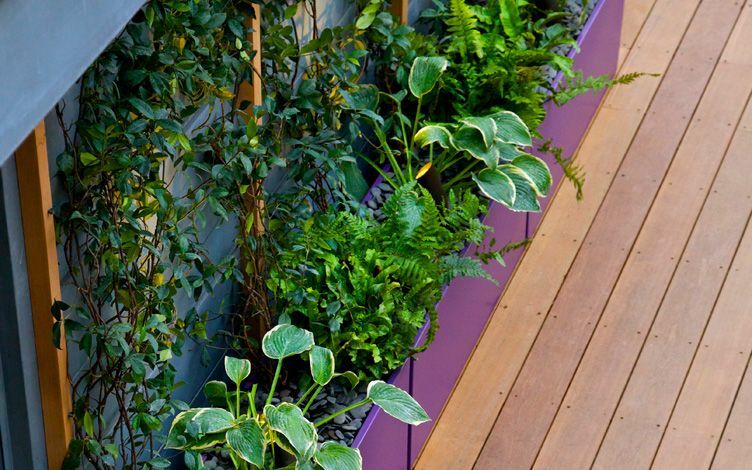 We designed a diverse flora palette, encapsulating each contrasting rooftop microclimate. 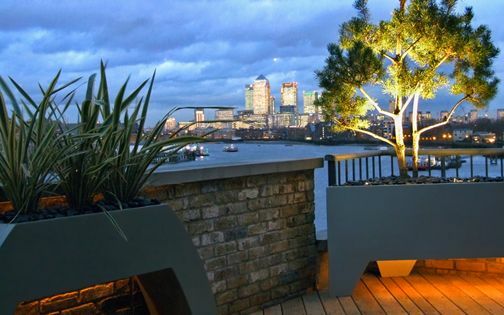 A low-lying Lavender veil frames city panoramas across a sunbathed upper roof terrace, while a trio of sculptural trees creates distinct focal points, anchoring the garden design's layout in pivotal corners. 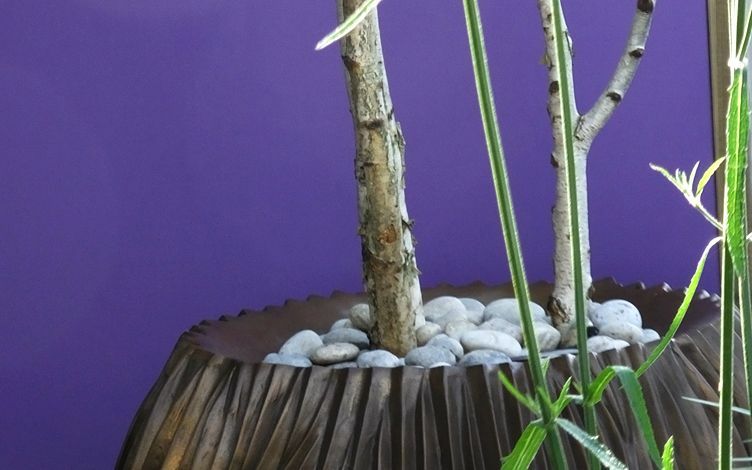 Silver birch, Olive and Sacred bamboo produce dainty foliage, filtering sunrays, and providing layered height. 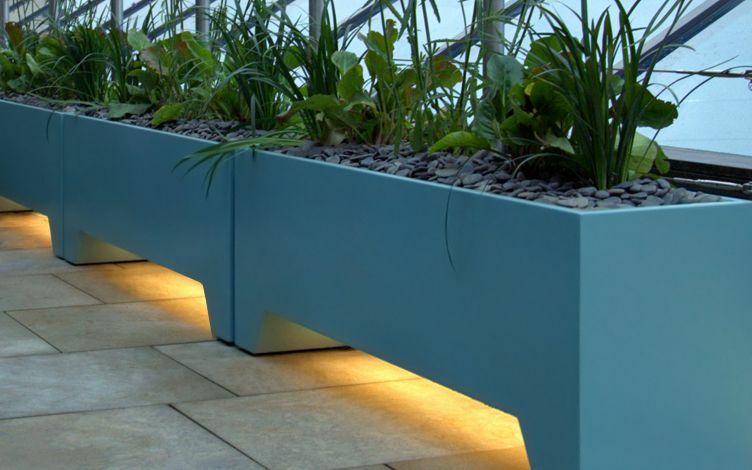 Aromatic herbs define the sculpture vista, planted in a series of elongated turquoise rectangles, and subtly lit by an LED afterglow. 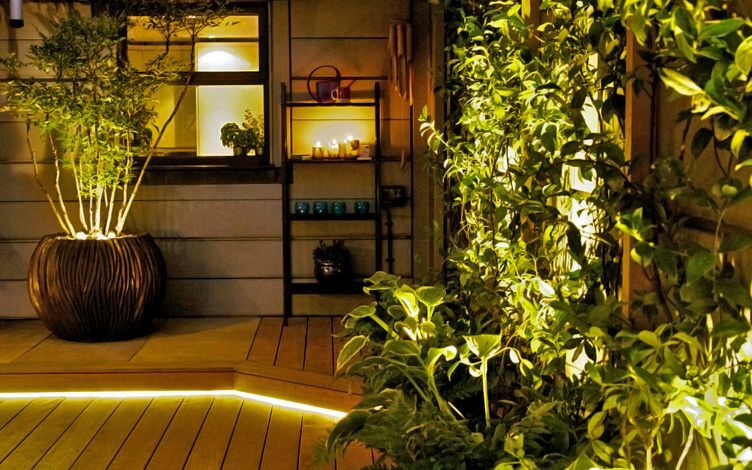 The shaded living room wall elevation was transformed into a lush evergreen Jasmine canopy, underplanted with Ferns, Hostas and Daylilies. 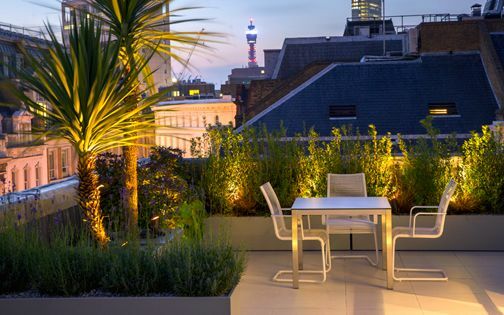 A drift of lofty Verbena leads towards a Birch tree at the roof terrace's far end, highlighting glimpses of the Shard's apex above a pyramidal glass rooflight. 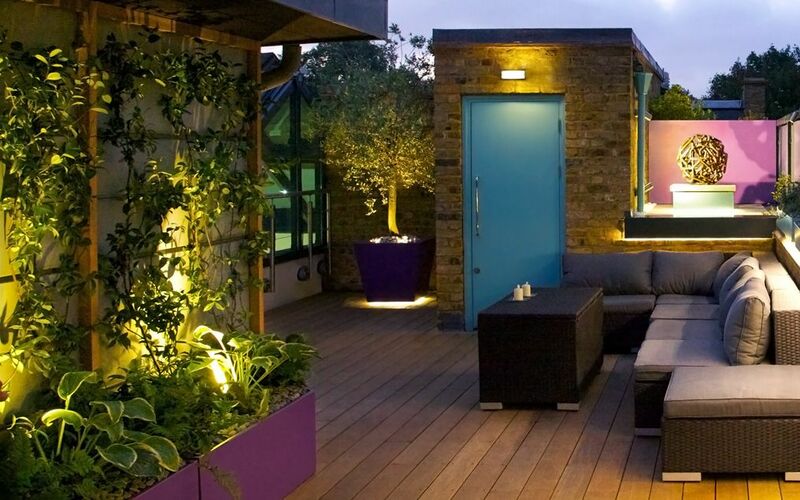 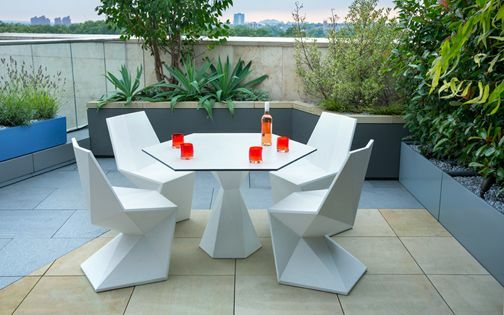 Angular deck landings enhance movement across this ergonomic roof terrace garden design, while defining access points to the kitchen and outdoor seating. 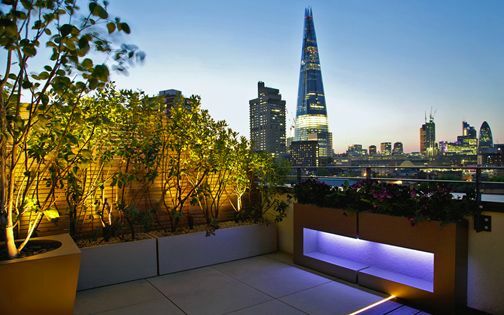 We detailed integral LED strip lights between natural stone and wood surfaces, augmented by zoned terrace lighting which extends functionality with an uplifting ambience. 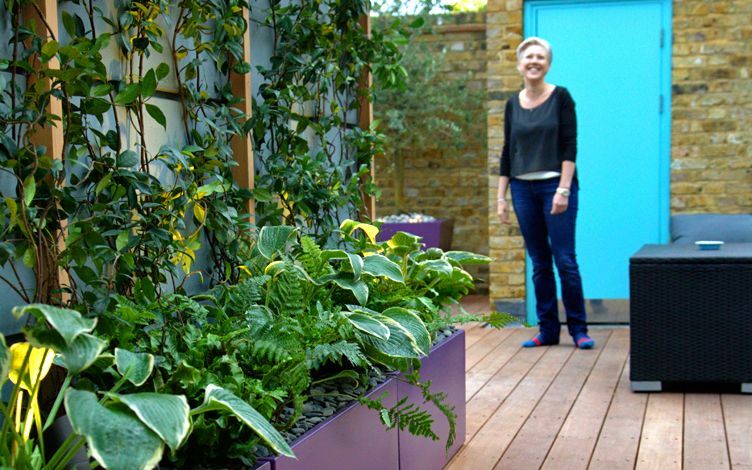 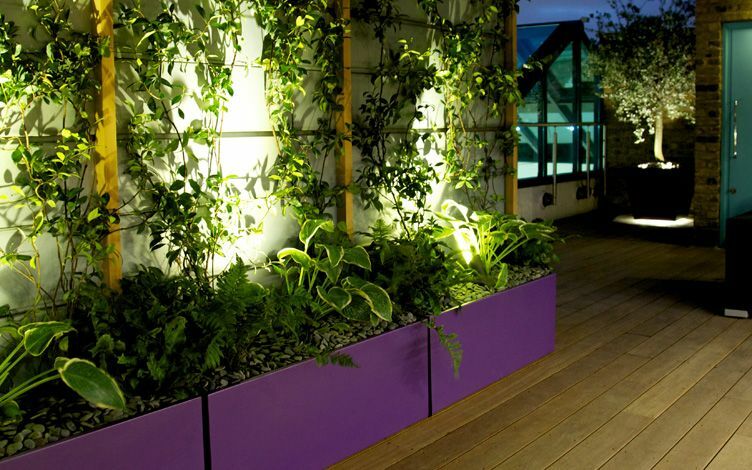 The elevated linear herb troughs enable handy harvest all year round, while a collapsible telescopic ladder provides a space-saving device to reach the upper roof terrace garden. 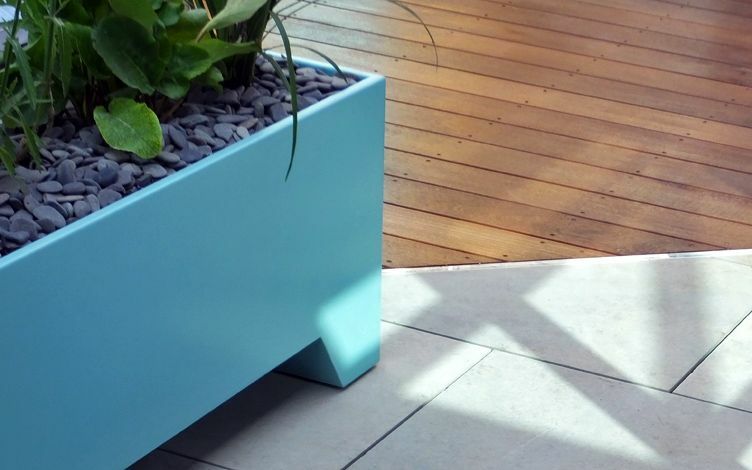 A series of powder-coated shelf units is situated along the living room walls, and frees up vertical space to display art, refreshments and seasonal blooms. 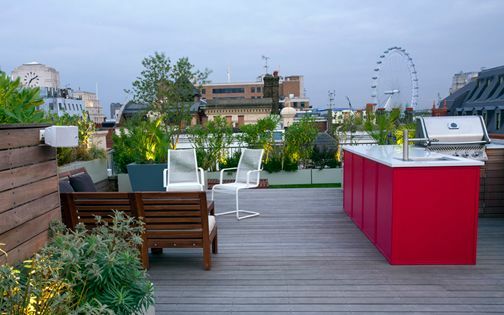 With the new roof terrace garden design forming a verdant soothing retreat, its perspective integrates connective urban views into a radiant Wapping residence, utilising a good measure of terrace trendiness, superimposed by bold colours and abundant architectural articulations.